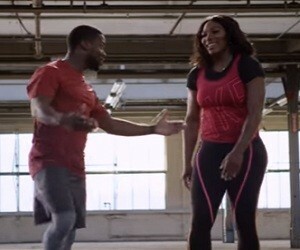 Nike Training shows you, in its latest commercial, the one thing that Serena Williams and Kevin Hart can agree on: workout music. The two discovered they both like to listen slow jams while working out. The 20-second spot features the unlikely duo at the Training Club Workout talking about their “secret” passion. The track playing in the background is a slow jam, as expected, namely “Romantic Soul” by Dean Landon & Caron Nightingale.